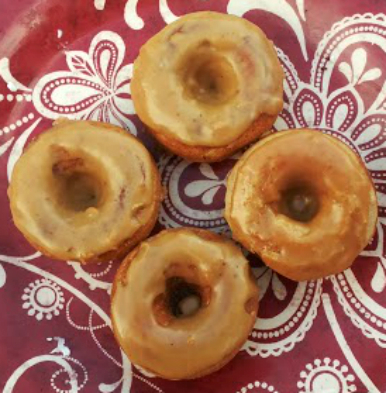 I couldn’t send you off into the weekend and on to my vacation without posting a donut recipe! 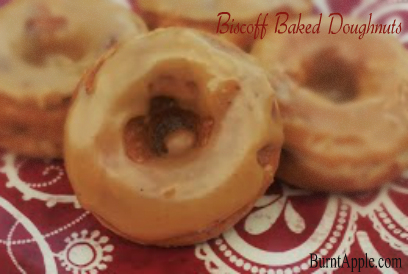 And it’s not any baked donut recipe, it’s a baked biscoff donut recipe! It wouldn’t be right. As you all know, biscoff spread is one of my favorite treats and one of the reasons I log so many miles each week. Okay, my sweet tooth in general requires a lot of logged miles. This biscoff recipe is absolutely delicious! You will want to break out the donut maker stat! And if you like this biscoff recipe, try some of our others! And if you’re looking for more baked donut recipes, we have those too under our Recipes section. Preheat mini donut maker. If using oven, preheat oven to 425 degrees. In a bowl mix together the milk and vinegar. Allow to sit for five minutes. In a mixing bowl, stir together the flour, sugar, baking powder, cinnamon, and nutmeg until combined. Make a well in the center of the dough and add the milk and vinegar mixture, the greek yogurt, the butter or non dairy spread and the biscoff. Stir mixture until smooth. In a lightly greased mini donut pan, fill the dough approximately 2/3 of the way full in each mini donut slot. Bake at 425 degrees for 8-10 minutes, or until lightly browned. Remove from oven and allow to cool for several minutes before moving to a wire cooling rack to finish cooling completely. In a small bowl, stir together the biscoff spread, milk, salt and cinnamon. Dip the tops of each mini donut in the biscoff spread, then return to the cooling rack to allow glaze to set up completely. HINT: Put some wax paper, aluminum foil or SOMETHING to catch all the drippings. It will make your life easier. Learned from experience on that one.